Wright Chat :: View topic - Lustron prefab for sale Des Moines, Ia. Posted: Sun Apr 14, 2019 10:44 am Post subject: Lustron prefab for sale Des Moines, Ia. The ugliest duckling of modernism? Possibly so, but they still deserve to be cared for and preserved! Looking for an overview of the neighborhood . . .
Beauty is in the eye of the beholder....behold the Lustron! They have a clean lined charm, and their durability, particularly when their porcelain enamel finish is not violated by nails from “improvements”, is unmatched. That is an original roof, now 70 years old! 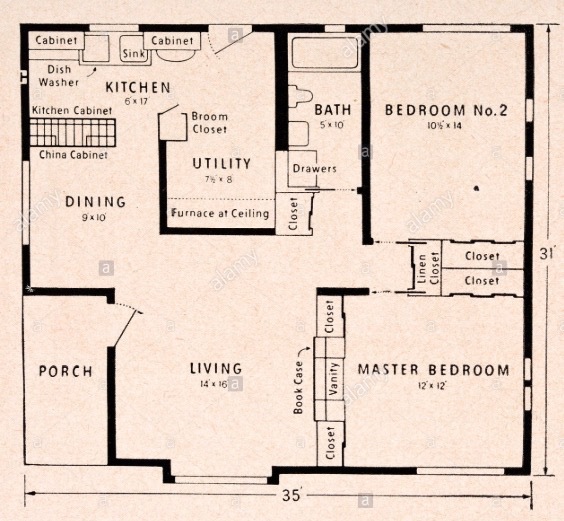 This house appears unchanged except for the removal of the kitchen pass-thru cabinet, new kitchen base cabinets, new kitchen floor, and a bathroom sink and toilet. A great example...it even has the relatively rare Lustron garage kit. I hope this house finds someone who appreciates it.These are great houses for single people or couples. My one Lustron sighting was of a lone beige house (or was it yellow) in the middle of nowhere, by itself, between towns somewhere in inland South Shore (an oxymoron ?) Massachusetts. Might have been Rockland, or Abington, or Hanover . . . The video was useful---would have been more so with a less decorated example ! I didn't pick up an echo---perhaps all the paper on the walls helped---but that steel ceiling could be expected to bounce sound quite nicely ? Interesting, too, to hear that the factory might have been a different one---one that PrestonTucker snagged to build his (also ill-fated) car. Doesn't all that metal get hot, or is the enamel sufficient insulation? Lustron's corporate fate reminds me of Solyndra's more recently. Reidy's question raises another for me: What is the roof structure of the house ? Are there steel trusses ? How are the metal roof tiles supported and connected ? Are structural drawings or photographs available ? Thanks; I copied a construction photo from your second link. Wrightians will want to compare this design to that of the Usonian, and perhaps to the Textile Block and Usonian Automatic systems in particular ? So---more expensive to manufacture than expected: a projected 450 houses per day turned into 40 houses, despite an enormous facility that included 11 porcelain-firing furnaces, each 200 feet long, etc etc. And then, more time-consuming to erect, in some cases at least ? As Jerry or George would say, ". . .That's a shame . . ."
In regards to the roof framing, I was once told that none of the interior walls were load bearing. So, if true, is it safe to assume a metal truss roof? that divides the "public" side of the house into two---or three---separate spaces . . .
invisibly, sharing their volumes and "breaking the box" from within ? Here's another, with several shots of exposed roof structure. It also shows that the houses used fairly conventional insulation. To my understanding, the L shaped partition SDR noted is required to support the forced air heating unit. The house is heated by a system of ducts in the attic beneath a bed of insulation that heats the ceiling panels...radiant heat. A well tended Lustron in nearby Haddonfield NJ was for sale in 2009, which my father was intending to buy as a downsized living space just before he passed. I got to “know” the house as he was considering the purchase, even going so far as obtaining a copy of the erection drawings for him. The house was comfortable on a cold day...the radiant system warmed the ceiling but that heat also warmed the objects and wall panels within as well. There seemed to be enough of a thermal break between the inner and outer panels that even the inside face of the exterior walls was not chilly. The single glazed steel framed windows were cold, though. The house was carpeted in all rooms except for the bathroom and kitchen/utility room which made the house seem normal with respect to echos which would only get better with some furniture. The only oddity I noted was that all surfaces within the house had the same sheen...I’m not used to a shiny house interior. My dad noted on a sunny day the reflections made the interior quite bright, l was only in the house on a cloudy day. I find the Lustron house to be a great opportunity that was missed for the housing industry....think of all of the poorly constructed “mobile” homes that have never moved leaking and moldering away, or the widely variable construction quality of the most ubiquitous house types that have proliferated the base single family home market. The prospect of durable, well made, practically designed basic housing that can be set up just about anywhere was and is enticing.